We are proud to announce that John T. Moynihan is our 2013 Youth Recognition Award Winner. John has been a member of branch J-006 since birth and is very proud to be a member. He is the only child of Susan and Joseph Moynihan. 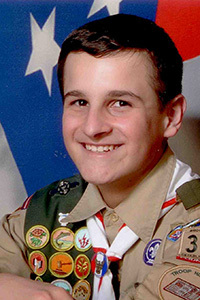 John became an Eagle Scout at age 14 and has earned 76 merit badges. He shows that any goal can be accomplished. Not only is he a very active member with junior branch 006, he was also a very important part of the senior branch Matching Funds Project for MDA Research, helping to raise over $3,200.00. John is always willing to help out at any FCLSA Cleveland event such as Join hands Day and the annual Christmas party at Light of Hearts Villa. He is a founding member of the Lucina Slovak Folk Dance Children's Group. Supporting his Catholic Faith, John is an alter server and lector at his Parish St. Thomas More Church. He also volunteers at St. Patrick's Parish for their Feed the Hungry Program – by serving meals to those in need. John is well liked by all. People have confidence in him and his leadership ability. He was elected President of his Student Council at St. Thomas More School and elected School Vice President. Not only do his peers think highly of him, but his teachers do as well. For the last four years, he has been nominated by his teachers and has received the Great Lakes Scholar Award. He earned the PALA Award (Presidential Active Life Style Award). He is an Honor Student with perfect attendance. John is involved in many extracurricular school clubs, including Spelling Bee Club, Disc Golf Club and Trivia Club. He belongs to the Safety Patrol and is an Advanced Band member in which plays the trumpet. John took an Honors Algebra class at St Ignatius High School while still in 8th grade. In his "spare time" he plays football, basketball and baseball. John will be attending St. Ignatius High School in the fall. John was nominated by S-176 branch officer Debbie Brindza, who says, "I am honored to have him in my branch." FCSLA congratulates John for representing our younger generation of members. John and members like him are the future of FCSLA. We are very proud to have John as our member and as our 2013 Youth Recognition Award Winner. May God watch over him and all his future endeavors.